Saturday, Aug.22, afternoon-ish to Sunday, August 23, afternoonish. 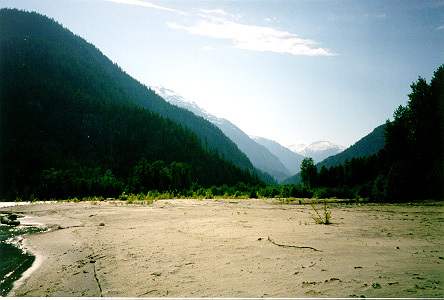 A forested riverside location about an hour north of Vancouver (not as far as Squamish). Directions will be sent in a separate message, or call 444.8024 on Aug 21. 5am - 6:30 Stonie (SF) ? 6:30 - 8am Geo ? Get out of those outdoor-party-grubbies, slip into your finest sparkling gowns and leisure suits, and let yourself sway to the choicest morsels of cheesy lounge music under the trees. Schwanky attire highly encouraged! - we're "roughing it"... there is no running water or toilets on site, so be good little scouts and *be prepared* and *be respectful*. - any extra hands are appreciated, so feel free to pitch in. - donations will be collected -- thanks in advance for your kind support! - space is limited, so most of the parking will occur along the broad gravel road. Please park tightly and close to the side to maximize space. Someone may greet you as you arrive and show you where to park. - please leave the main areas clear for grooving activities. - due to the dry weather, there *may* be fire restrictions imposed. If that is the case, please protect our forests by not lighting campfires and by disposing of cigarettes in containers provided. Bring warm clothing and camping stoves instead. We'll keep you posted if fire restrictions change. - please take out with you *all* litter you bring in, and dispose of cigarette butts in containers provided. .......the picture says it all!!! Azimuth is a free camp-out style party, brought to you by your family and friends at Bside. Although our motivation is from the heart, we do not have bottomless pockets; donations are welcome. If you would like to contribute/volunteer (parking, set-up, clean-up, games supervision, etc.) please contact us by phone at 254-3468 or e-mail us. We should have the sound system set up by the middle of the afternoon (4-5 p.m.) and will be providing beats from that time till sometime Sunday afternoon. Bring a loved one, lotions, potions and lots of water, wine, food, warm clothing and shelter. Most of all bring your phattest attitude. Please respect the site, remember to take with you all that you bring. All help, cleaning and maintaining the site is appreciated. The Azimuth site is 30 km from the closet store. If planning on picking up supplies or gasoline do so in Squamish. We will have a supply of water available, but we are uncertain how many of you will be attending. Please bring all the water you plan on consuming and a bit more. The river water is silty but perfectly safe to drink. No presales. "Ne presale pas." Doors will be closed when we reach comfortable capacity, so plan your arrival early. ...these dj's feature a variety of sounds including trance, house, d&b... MC Lips will provide occasional mellow vocalization to the funky beats. Hopefully something to make every bunny-booty wiggle a little. As inspiration for your body, Blossom will be preceeded by a live contemporary dance performance (thanks to Moonlit Odyssey), which all are welcome to attend for an extra 2 bux (these dancers are wa-a-a-ay cool!). The performers are variety of independent local modern dancers who would *love* and need your support as audience members. The performance will begin at 8, end around 10:00, and the party begins as soon as we can set up after (doors will be closed during performance). B-SIDE is itchin' unveil our new kickass sound system during this event...so tell us what you think of it! ...brought to you by Whirled Bees, a collective consisting of MindBodyLove, Alchemist Productions, and Bee Tribe. On April 12, Make Friends Not War will happen in front of the Vancouver Public Library. For up-to-date location information or general inquiries, please call 215-4681. The B-Side crew will be helping out at HQ Communication's X-Mas party! Come check it out. One is a free party, but because of space restrictions, we cannot guarantee entrance to anyone who doesn't have an invitation. Get in touch with any of us to get your hands on one! © 1998 B-Side Maintained by Skye.